The double doughnut of democracy is the idea that government should not engage directly with the public. 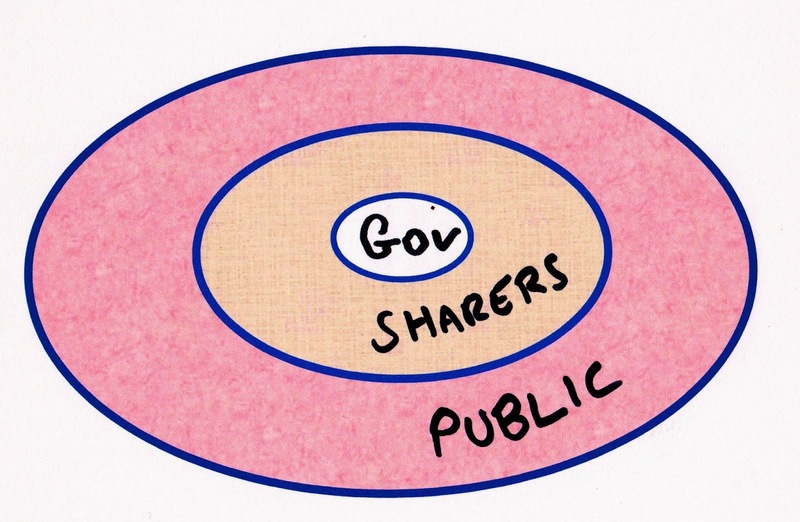 Instead public engagement happens through a ring of sharers such as councillors, community groups or the media. While potentially more effective, this approach implies that government has to work in a different way. This idea draws on three sources. The first is a conversation we had about online democracy at govcampcymru. The second is a set of ideas developed by Catherine Howe that I heard about first at localgovcamp. While Catherine is more interested in a citizen perspective here the implications for government are centre stage. The third source is some conclusions form the academic literature. Lawrence Pratchett in a paper for Parliamentary Affairs suggested that intermediate bodies such as the media and community groups might be the best route for public participation as local government is essentially a representative rather than participative institution. Similarly, Marion Barnes, Janet Newman and Helen Sullivan in their research into public participation, suggested that participation initiatives might be more successful when semi autonomous from government and run by voluntary groups. The double doughnut of democracy is essentially a public engagement strategy for local government (or any government for that matter). It is underpinned by the assumption that local government has neither the capacity or the capability to involve the public in the democratic process; it's just not very good at this kind of thing. Explaining why public participation is such a big challenge for local government is a big topic - more here if you are interested. Instead local government should work with the sharers - the people who can take the stuff of democracy, engage with the public and report it back into the process. This last point is of course a massive practical and cultural challenge - recognising that it needs to happen would be a good start.